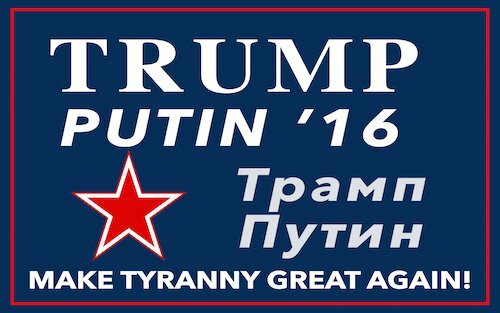 This video displays the above “Trump-Putin ’16 Make Tyranny Great Again!” poster. It is an ad that Republican Presidential candidate John Kasich had made and paid for. (2) It mirrors the Republican Establishment’s view that Trump is too friendly with the Russian President. Donald Trump is the only presidential candidate, Republican or Democratic, who is not part of the political Establishment. Since he self-funds his campaign, he is not beholden to any special interest groups, especially ones in the military-industrial complex. A real estate-focused businessman and TV reality show star, he has no stake in the neoconservative effort to subdue Russia and have Washington dominate the world. Trump views U.S. wars of intervention and occupation around the world, all in countries that pose no threat to American citizens, a waste of taxpayer money. He is the only candidate in either party who will question the cost and legitimacy of our commitment to Cold War relics like NATO and continuing to station troops in S. Korea; our country’s involvement in religious civil wars in the Middle East and overthrowing and killing secular dictators there it doesn’t like (Hussein and Kaddafi); and our threatening Russia by encouraging its neighboring states of Lithuania, Latvia, Estonia, Ukraine, and Georgia to join NATO and give them weapons and military guarantees to defend them. U.S. exploits are leading America to the brink of war with Russia—and possibly, given its actions in the S. China Sea, to war with China as well. Putin has said, “The U.S. wants to subdue Russia, to solve U.S. problems at Russia’s expense. No one in history ever managed to do this to Russia and no one ever will.”  More ominously, in a speech delivered at the Valdai International Discussion Club in Sochi, he states, “Russia does not wish for chaos to spread, does not want war, and has no intention of starting one. However, today Russia sees the outbreak of war as almost inevitable, is prepared for it, and is continuing to prepare for it…”  Is World War III inevitable? The current Crisis Turn in America’s Millennial Cycle began in 2008, set off by the Lehman Brothers collapse and onset of the Global Financial Crisis. Anticipated to last until 2026 when a new Cycle will start, we have 10 years to go until we get through it. If the current (2008-2026?) Crisis Turn follows the course set in America’s three previous Fourth Turnings, there will be a World War III. Like with the Great Depression that preceded World War II, the ongoing Global Financial Crisis is setting the stage for World War III. 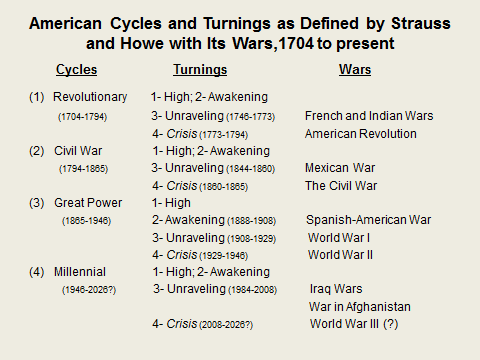 In the American Revolution (Revolutionary Cycle Fourth Turning), there were 25,000 military and civilian deaths. In the Civil War, there were 750,000 military and civilian deaths. In World War II (Great Power Cycle Fourth Turning), 85,000,000 people died. World War III will, in all likelihood, turn nuclear. The Nuclear weapons stockpiled today are 50 times more powerful than the two atomic bombs the U.S. dropped on Japan in 1945. In the next war they could cause 1,000,000,000 (one billion) military and civilian deaths, or more. America must adopt a non-interventionist foreign policy, as advocated by the nation’s founders, to avoid a nuclear WW III in this Fourth Turning. The next eight years will be a very crucial time in human history.